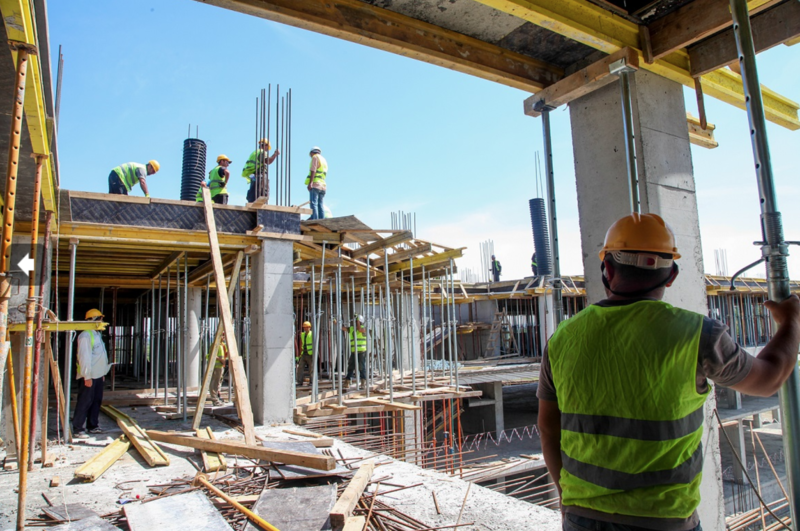 Construction workers on site at the new hospital being built in Rukhi, Georgia near the border crossing into breakaway Abkhazia. The hospital will cater to Abkhazian citizens seeking medical care in Georgia. (Photo by Georgia's State Construction Company). 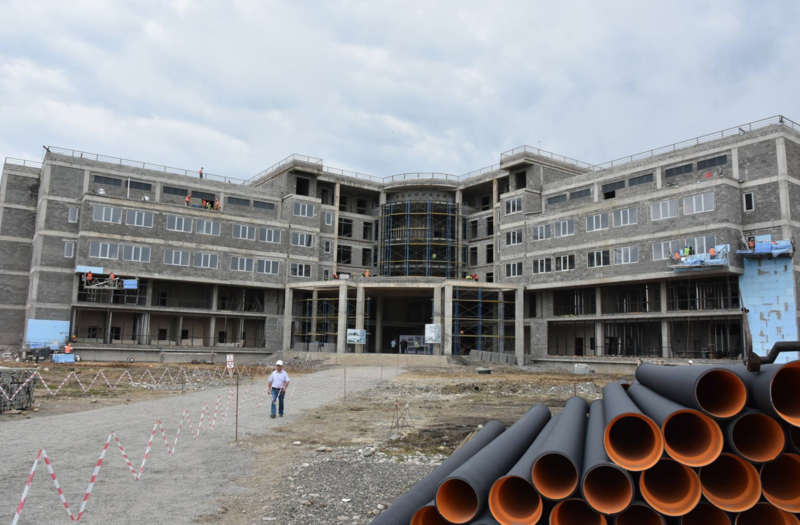 Two kilometers from the border crossing into breakaway Abkhazia, the village of Rukhi seems like an unusual place to build a cutting-edge hospital. But for Tbilisi, humanitarian aid is one of its last remaining tools in the battle for the hearts and minds of its prodigal citizens. The project is certainly ambitious. Along with its seven blocks dedicated to medical care, the 41 million lari ($16.5 million) hospital will include classrooms, libraries, sports facilities, and even a swimming pool on site for its medical students and staff. In recent years, Georgia’s universal health insurance program, which applies also to residents of separatist regions, has been providing medical care free of charge. And the number of residents in Abkhazia and South Ossetia who rely on these services is growing. In 2014, 450 Abkhazians came to Georgia for medical assistance, which increased to more than 500 in the first five months of 2016 alone. For South Ossetia, the numbers are proportionately larger. In 2012, just 63 residents went to Tbilisi, but by 2016 the figure stood at around 260. The idea of building a hospital so close to the border has received criticism in some quarters. But Kanashvili said such arguments may be missing the point. In the past, Abkhazians were discreet about their travels. Now, it’s not uncommon to see locals starting up public fundraising campaigns to pay for their travel expenses to Georgia. Nevertheless, the de facto leadership in both separatist territories – as well as their patrons in Moscow – are skeptical of these trends. In December last year, the Russian Ministry of Health and its counterpart in Tskhinvali signed an agreement allowing some South Ossetians to access Russian medical services. He also expressed hope that if the policy doesn’t “completely eradicate” the need for South Ossetians to travel to Georgia, it will at least “neutralize the process.” In July 2013, Tskhinvali passed a decree aiming to restrict its citizens’ use of Georgian medical services to “exceptional cases” only. But it remains largely ignored. Russia concluded a similar agreement with Abkhazia on August 8. Both regions declared independence from Georgia in the early 1990s following the collapse of the Soviet Union, triggering years of violent conflict. After Russia’s 2008 war with Georgia, Moscow formally recognized both governments, and healthcare has become a political football. Up until 2014, the Abkhazian leadership had a relatively open attitude toward receiving aid. “What can I tell a mother whose child is dying if I don’t let her cross the border to receive treatment?” former de facto President Aleksander Ankvab rhetorically asked. Since his ousting by hardline incumbent Raul Khajimba, though, policies viewed as “soft” on Georgians have become political targets. “There was even a social media campaign two years ago encouraging people to boycott the funerals of anyone who died after seeking medical care in Tbilisi,” said Olesya Vartanyan, a researcher for International Crisis Group. Both Abkhazia and South Ossetia suffer from chronic problems in providing health care. For Abkhazia, foreign aid through UN agencies was used to rebuild hospitals following the 1992-1993 war, but with limited success. Local doctors – educated in the Soviet Union – often cite demand for professional training, and say their lack of access to new methodologies and health protocols is a serious problem. In addition, modern diagnostic equipment is scarce, especially outside Sukhumi, the de facto capital. Less is known about the situation in South Ossetia, but the volume of residents traveling to Tbilisi suggest a similar picture. In addition to its high-quality free services, Georgian healthcare is easy to access, requiring very little documentation. For people traveling to Russia, registration can be a complex, and often humiliating, process. “Many years ago, one of Abkhazia’s most senior political figures told me he had to register himself as homeless in order to be entitled to Russia’s services for those in need,” Vartanyan said. Meanwhile, Georgia has been softening its requirements for Abkhazians to get medical care. Still, welcoming gestures like that can be sabotaged by hardline policies in other areas, like Tbilisi's escalating war against Abkhazian representation abroad. Most recently, in December it began a diplomatic dispute with Scotland over a war memorial to those who died in the Abkhazian-Georgian war. 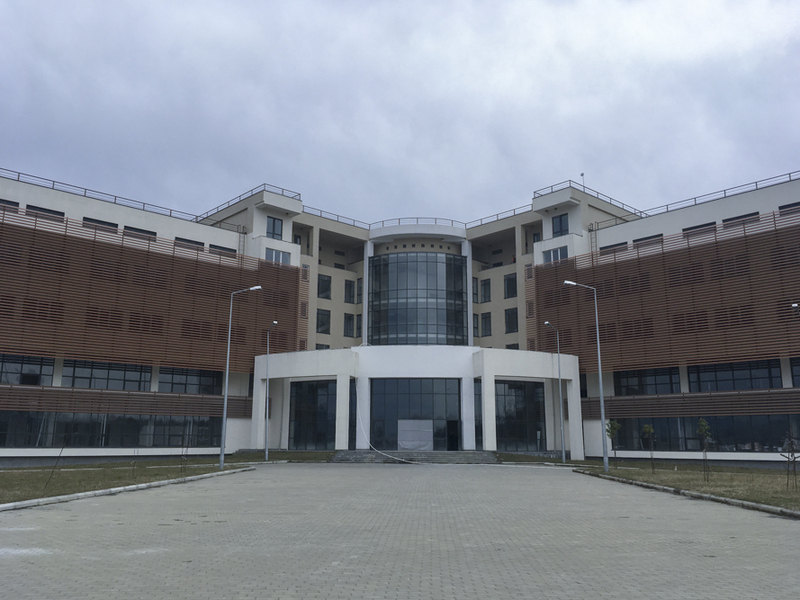 And for some, building a hospital so close to the dividing line between Georgia and Abkhazia may be sending the wrong message. Bradley Jardine is a Tbilisi-based Eurasianet contributor and freelance journalist.